Another warm day in Delaware at 55 degrees so more stripping on the hull. I decided to try a heat gun over chemical stripper. I was watching "tips from a ship wright" videos on facebook featuring Louis Sauzedde (I highly recommend these videos, each is entertaining and informative). 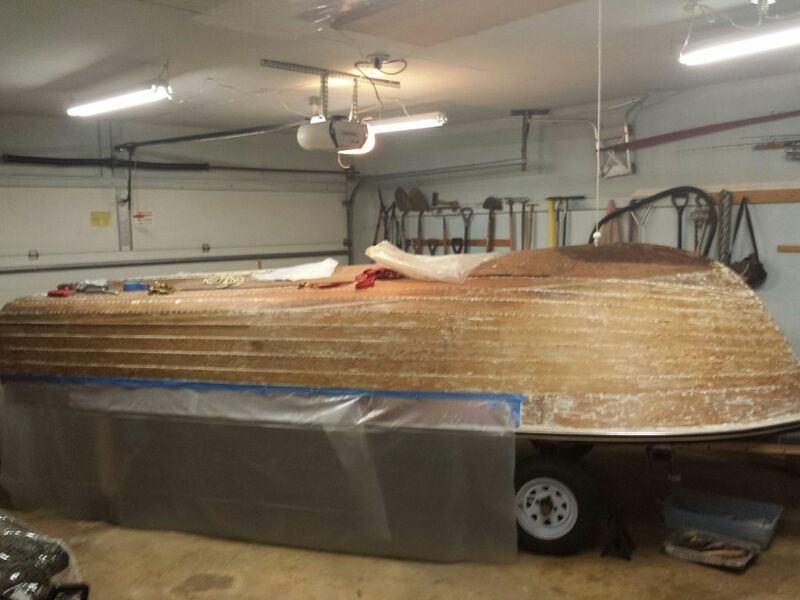 In one of his videos he is using a heat gun to strip a caravel planked boat. His gun must be super powerful because the paint would almost instantly smoke, burn, and fall way with just a touch of the scraper. Such heat that he was wetting the wood at the edge of the strip line to keep it from charring. I was expecting the same from my $39 Porter Cable. That would be a 'not'. My gun is not that hot and that's probably a good thing. Moved the boat outside and wore a vapor respirator as I have to believe the original paint is lead based and we cant be inhaling any lead fumes. Took a bit to get the hang of it, but once I established a technique I was able to move alone fairly quickly. Working an area of no more that 4X4 inches square, heat the paint until is starts to bubble. Then with the heat gun still on the paint, I used a sharp paint scraper and scraped the paint off. 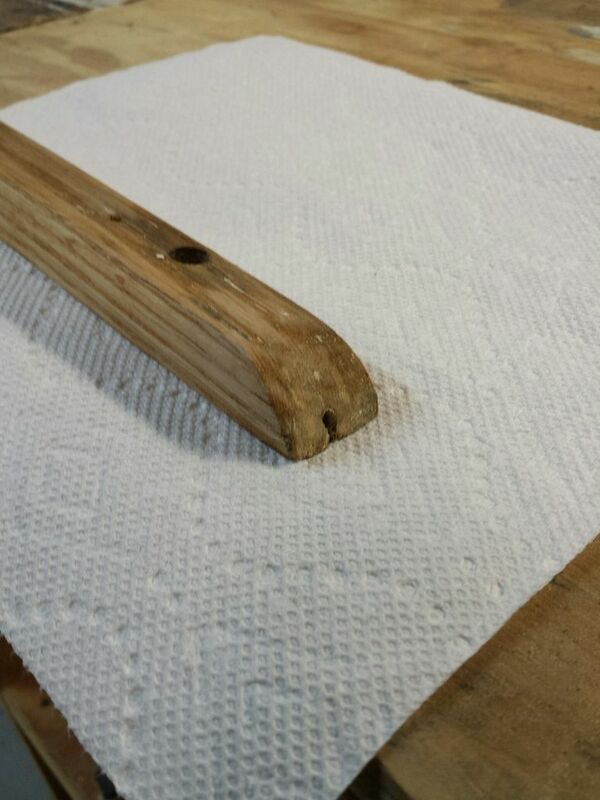 Most times the scraper takes all layers off down to the wood in one or two pulls. Now, it doesn't get it all, usually leaving a very thin layer or paint residue. What little is left I'll with stripper. I was being very cognizant not to over heat the plank for fear of damaging the glues in the plywood layers or the sealer in between the laps. I'm not going to use the heat gun on the plank next to the bright finished sheer strake, for fear of damaging the finish, or on the painted section of the sheer strake itself as this is a thin piece of plywood (maybe 1/8th) that i don't want to damage it either. In the end, I think the heat gun will save alot of time, even with having to go back and hi the areas once more with stripper. Took about two hours (start to clean up complete) to strip 8 feet off five planks. Stripped the port side splash rail. A non-event most would say, surly not worthy of a post. But I was just so impressed on just how solid this piece of Oak is after 55 years and having spent so much time in water. Used a paint scraper, and then a block plane to strip the paint and fair the surfaces (top picture is before block planing). I may shorten and reshape the ends a bit to sweeten them up. Peter, great pic of rail. Did not remove mine, but mine had "extra" screw holes on bottom side? I filled with caulk to keep water out. No rot though. Keep it up. Whilst waiting for another warm day for hull stripping I've been working on odds-ends in the basement shop. 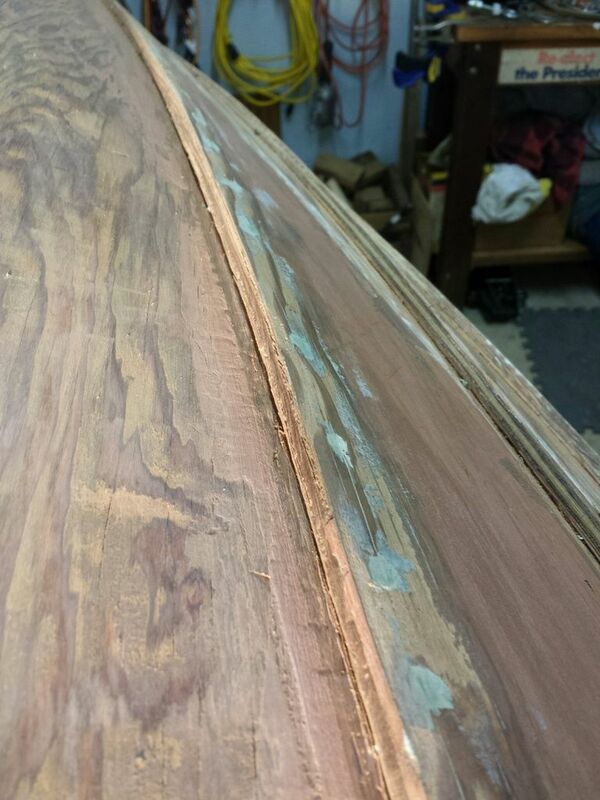 I stripped all the paint from the outer keel and sanded with 80 grit. Cleared out the bolt holes with forstner bits of the same size as the hole on the drill press. 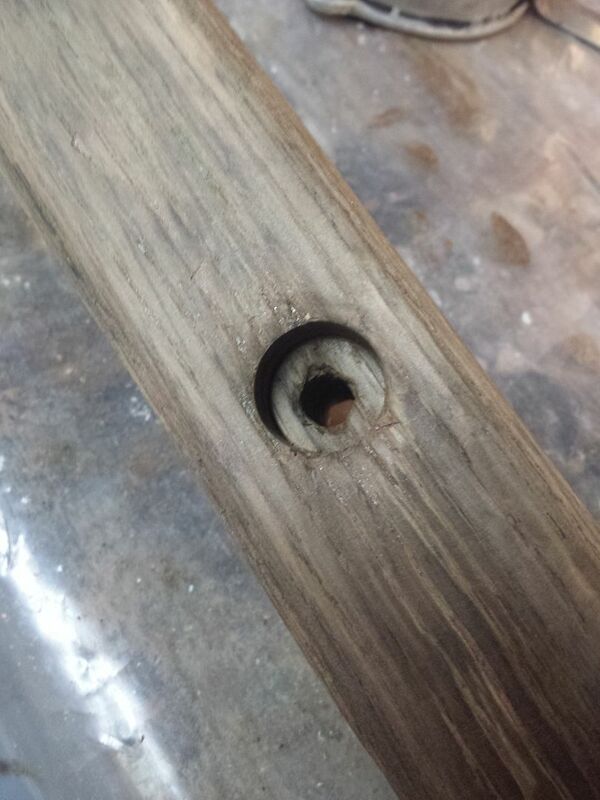 This created nice clean holes with a nice flat bottom for sealing the bolt head. There are some small soft areas on the side that was up against the bottom. The plan is to seal the piece with CPES, which should address the soft areas. 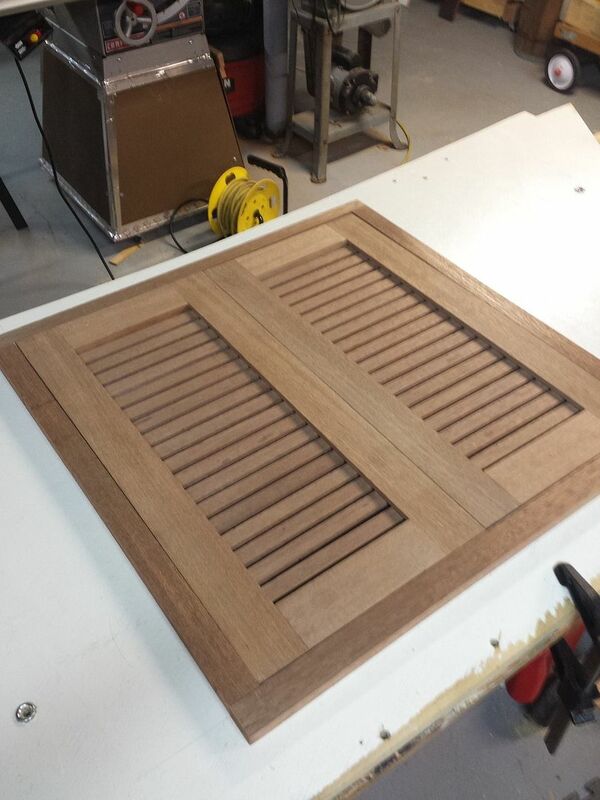 With the outer keel ready for sealing on the next warm day, I turned to finishing the build of some new mahogany cuddie doors. I cut and installed this under the dash bulkhead a few seasons ago. 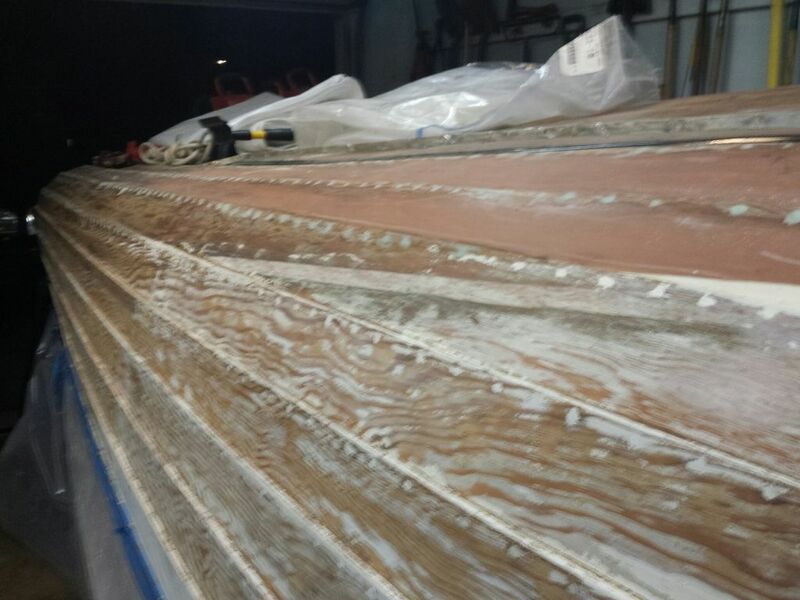 It's 3/4 inch, high quality exterior plywood suitable (according to the literature) for above water line marine applications if properly prepared (there are no internal voids, etc). It's great stuff, wish I could find it again. 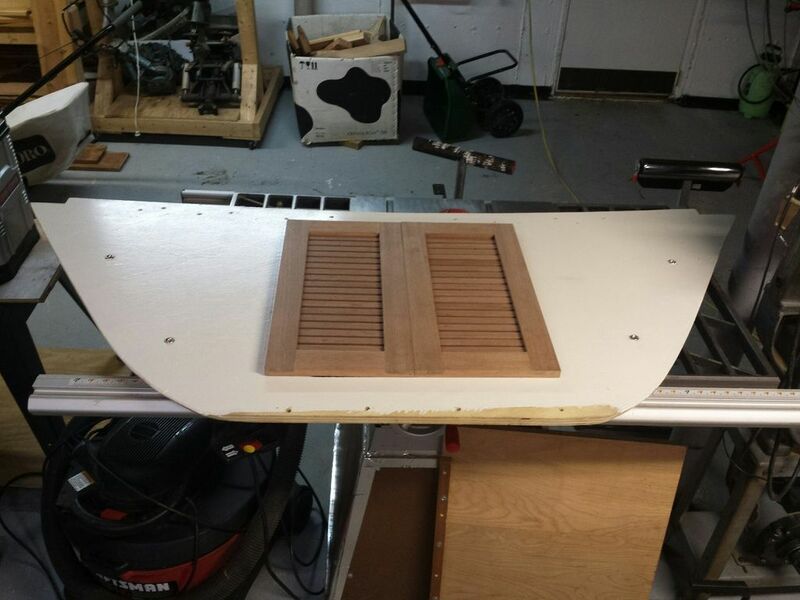 When installed, its bolted at the bottom to the keel, at the top to the deck framing and two brackets on each side, which in turn are screwed to two frames each. I've sealed the edges and back with CPES. The front was already painted so I will freshen that up. The mahogany for the doors and the trim on the bulk head I recovered from a neighbors house who was gutting the family room (the wood is from box beams on the ceiling). The tricky part me thinks will be to get the stain even close to the rest of the bright work. 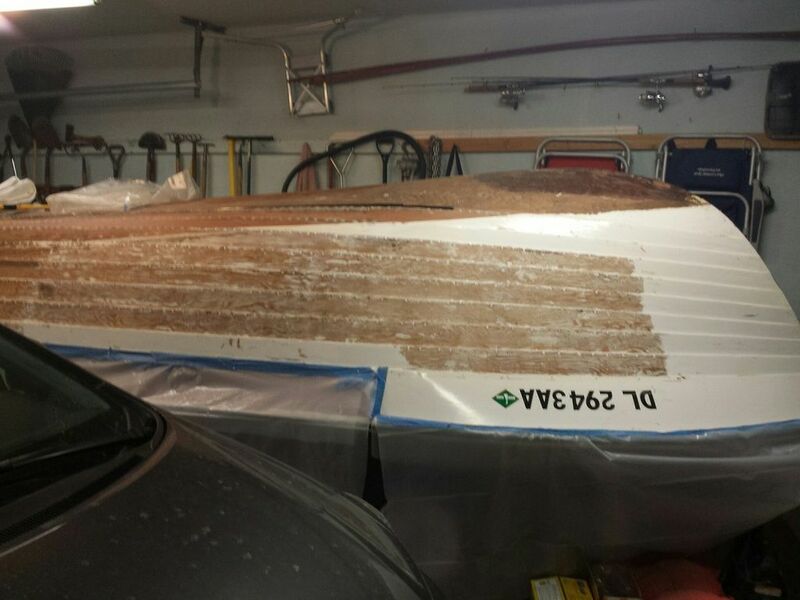 Half way there on stripping the hull. The other side is underway. Next is redoing the screw hole filler and sanding. I haven't posted in a while, but have been working on the hull whenever possible. Hour here, two hours there. I've gotten all the paint off the port side and all the screw/bolt hole filler out of all 800 or so holes on that side. I was using a couple of sharp pics to pic the putty (or expoxy, or caulk) out of the holes trying my best not to damage the surrounding wood (but not doing well there). 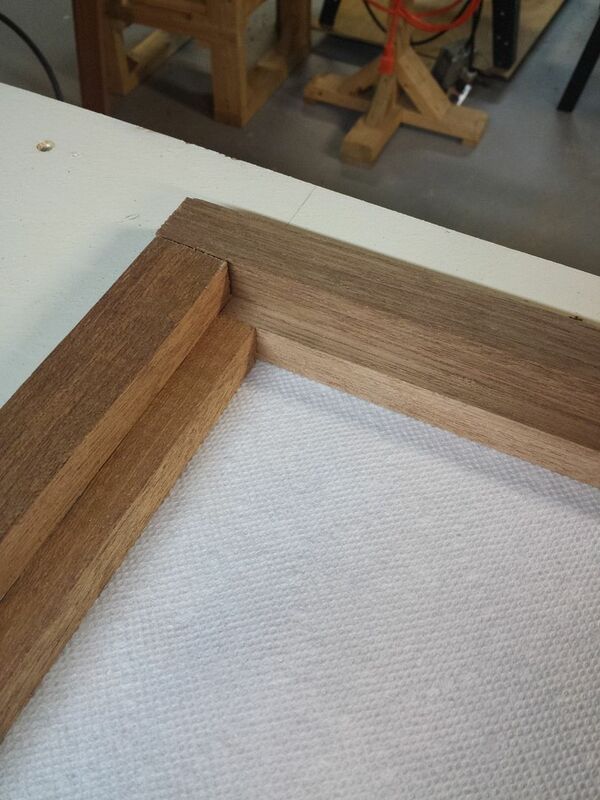 For example pulling up shivers of the top ply. I got pretty good at it but it was slow going. And my hands were sore! I tried a couple of other methods or tools but to no real advantage. 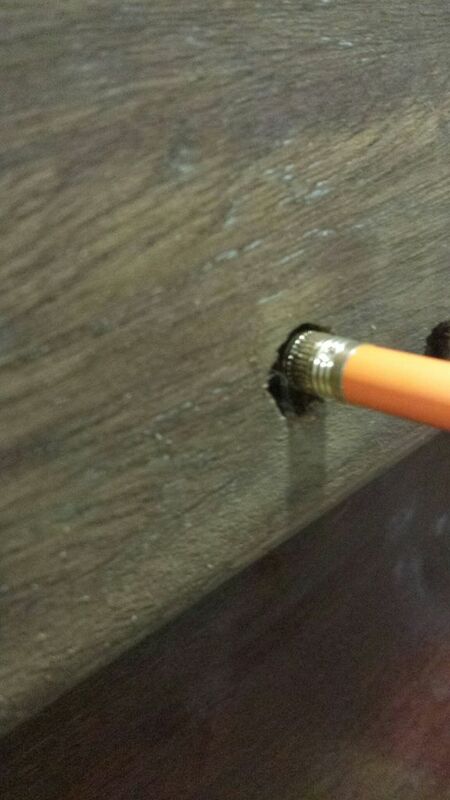 I tried using a drill with a bit just smaller in diameter than the hole to get most of it, but it was hard not to damage the screw or bolt head, even when I flattened the tip of the bit. A small bit worked better but the drill is hard to control nd gets heavy fast. Then the other day I was at the dentist getting (yet another) tooth drilled and I thought "man that drill of his would be perfect and then it hit me... The Dremel! Using the Dremel with the Dremel drill bit worked fantastic. With the tool at half speed, Drilled into the middle of the putty till I hit the screw/bolt head, then work outward in circles till I would start to see sawdust. Easy to control, doesn't hurt the screw/bolt hole, Gets all the putty, and its really fast. After 6 or so holes, I would pause and use a very sharp pick to get the putty out of the bolt head slot, or the screw's Fearson slots. I could do an entire plank in a half hour. So why bother with the slots/fearsons? 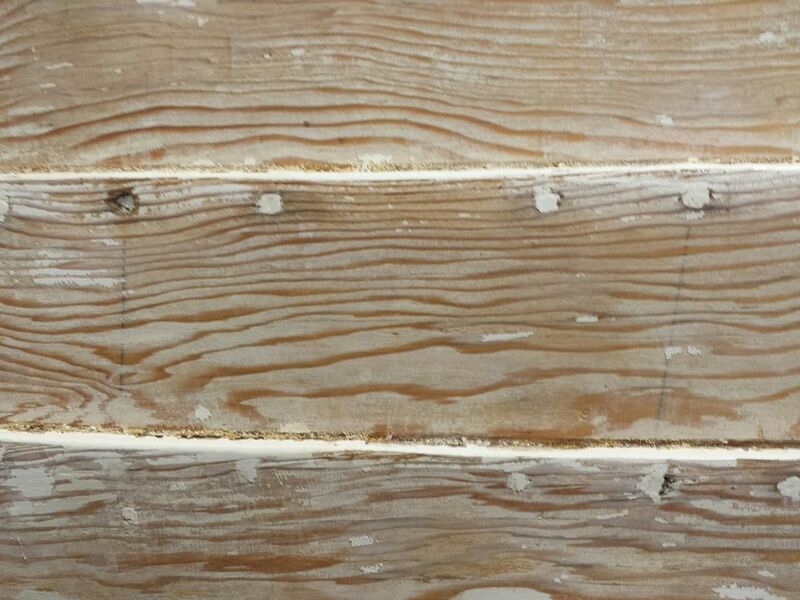 As I was working away one day my son asked me why there was such a large gap between two planks where they over lap. I was stopped in my tracks. I had seen that (and other gaps) and had caulked them up (and cleaned them out in this project) and never considered that, yeah, that shouldnt be there. Loose fastners? Tried a few at the gap and geez some would turn 3, 4, or even 5 turns before tightening up. The order of the next steps. 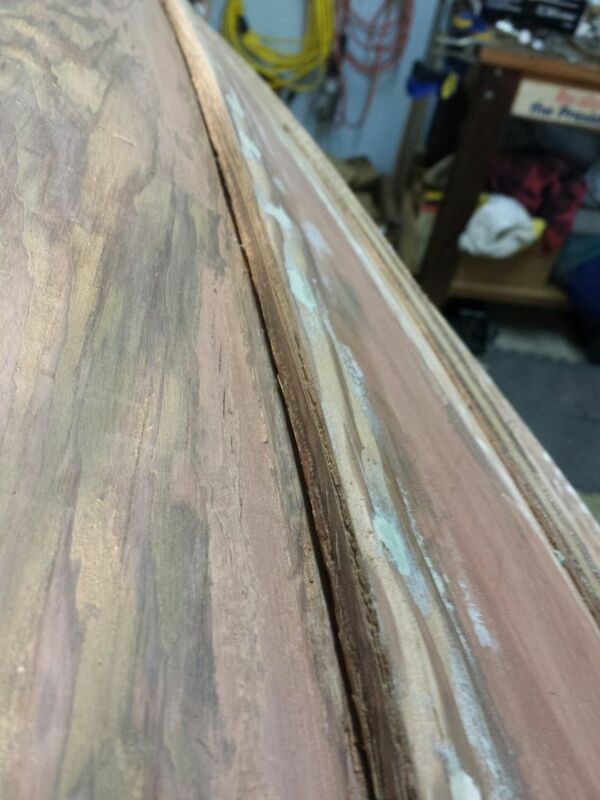 I will strip the other side and the garboard panels and clean out the bolt/screw holes, then re-tightened the planks as described alternating back and forth from port to starboard working upwards to the garboard panels. Then seal the entire outside of the hull with CPES. 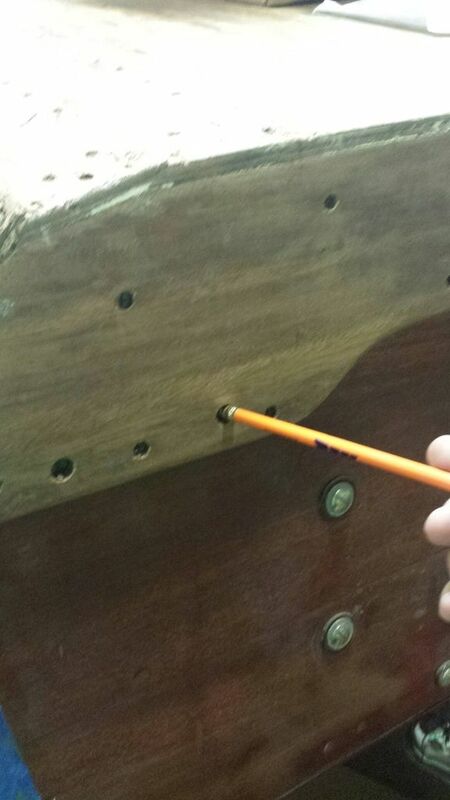 Then repair the damage at the plank ends with Epoxy Filler ( Then fill the bolt holes with filler. Then sand sand and paint, etc. I'll be 100 years old when I splash her next. One more thing; SMITH's CPES and filler vs TOTAL BOAT; I have used both. No contest, Smith's is head and shoulders the better product. Smith's CPES penetrates much much better. The filler is much easier to work. But here is the link pin. Smith's CPES remains flexible after full cure. Total Boat, rock hard. Wood moves and flexes. You want the epoxy to do the same. Total boat touts that there is no smell. Yeah, it doesn't smell much, but are you really going to work with epoxy and NOT wear a respirator? All this is My opinion yes, but I'll never deviate from Smith's again. I'll be using Smith's Fill-it - great stuff. 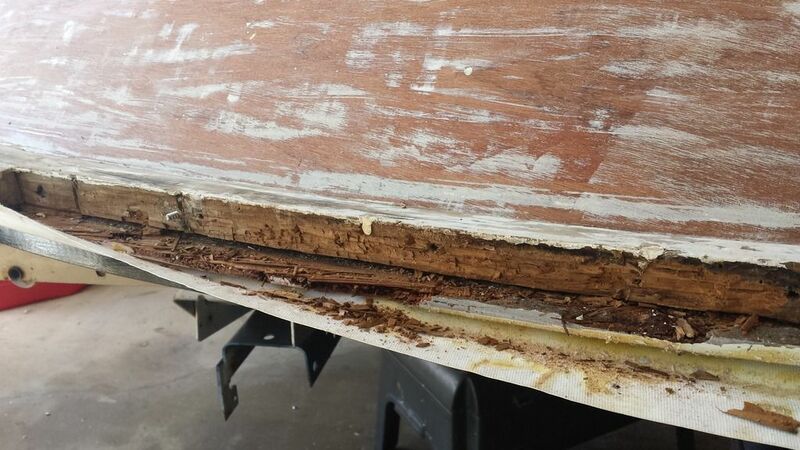 Used it before on the bottom to repair Delamination of the garboard panels and transom. After 10 years it was rock solid no change. I've used total boat's epoxy filler, but it's not nearly as good in IMO. The paint stripping is completed and I am hoping to be done with the bung removal today. Then I'll move on to tightening/replacing all the planking fasteners as mentioned up above. My mother always said, "Don't pick at a scab'. That's good advice that I have never been able to heed. 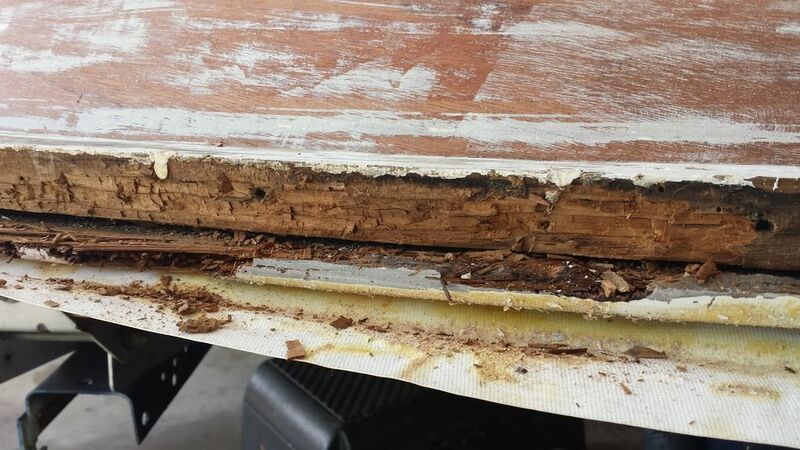 When I was removing the caulk from the underside of the deck I noticed that the wood, which is a thick piece of steam bent Oak, was moving very easily. So decided I would tighten or replace the screws with larger ones. Well to do that I had to take off the rub rail which was easy. Of course, I discovered yet more overtly sloppy work from the guy before me. 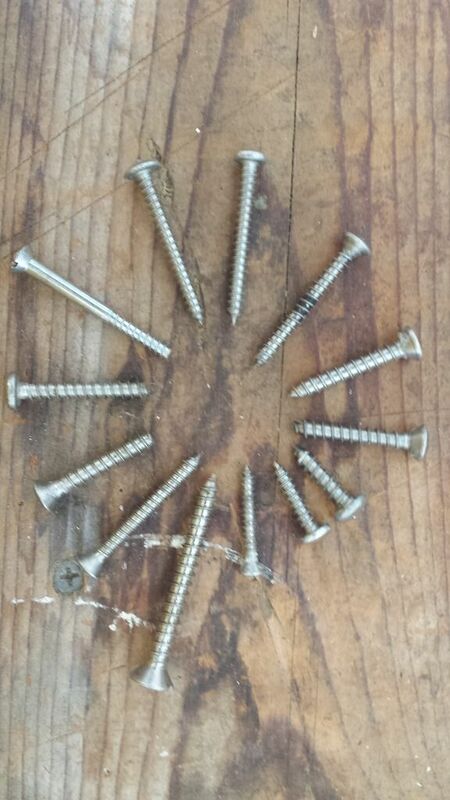 Check out this array of screws used to fasten the rail on, This isn't all of them, just an illustrative sample. Yeah, it worked as the rail never came off, but I'm one for doing it right and doing it neat. What did you end up doing about the rib ends? Weren't some of them rotted? 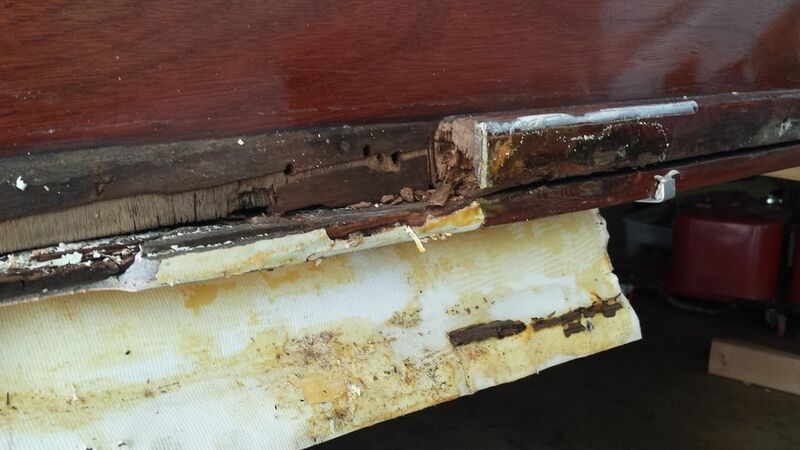 There are a few frame ends right at the very bow that are rotted away. Once I get the boat back upright from the hull work, I'll address those - thinking either steam bent replacements, or maybe laminating/scarfing in new ends. It's been a few weeks, but finally found time for some boat work. 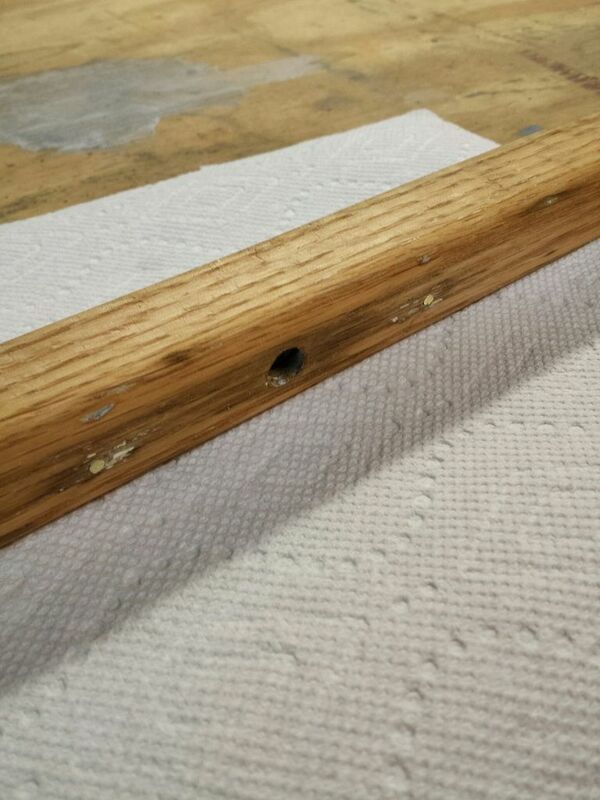 Finished off removing the filler from the screw holes. 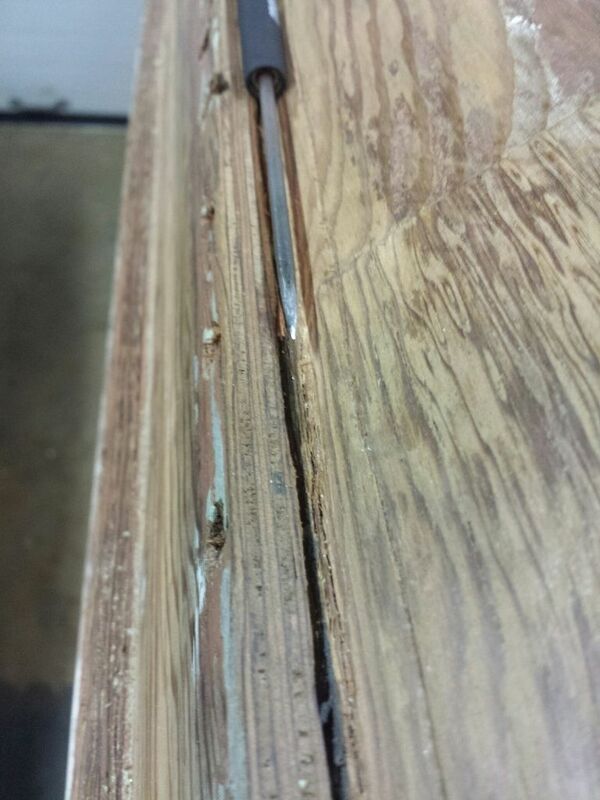 The upper planks go really fast as the putty was very dried out and most would just pop right out. Probably helps that the boat is bone dry as it is in my garage and it has been hot as al get out for several weeks here in Del. I keep the garage venting, so it's not like an attic, but, she's dry. 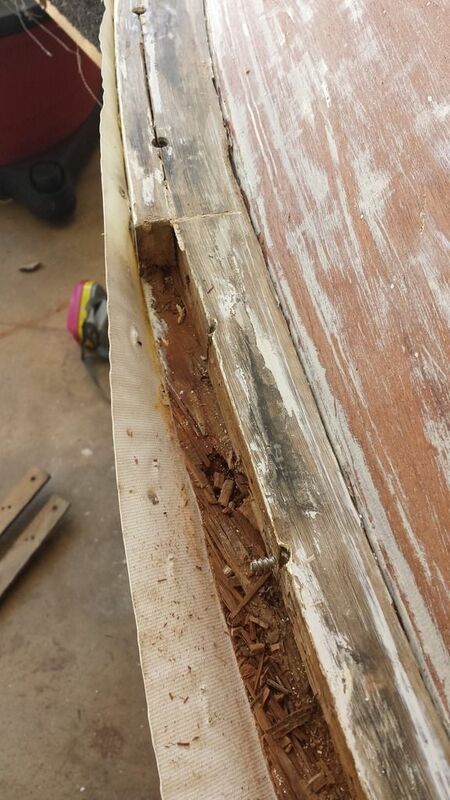 Also cleared out the putty from the screws on the transom board. 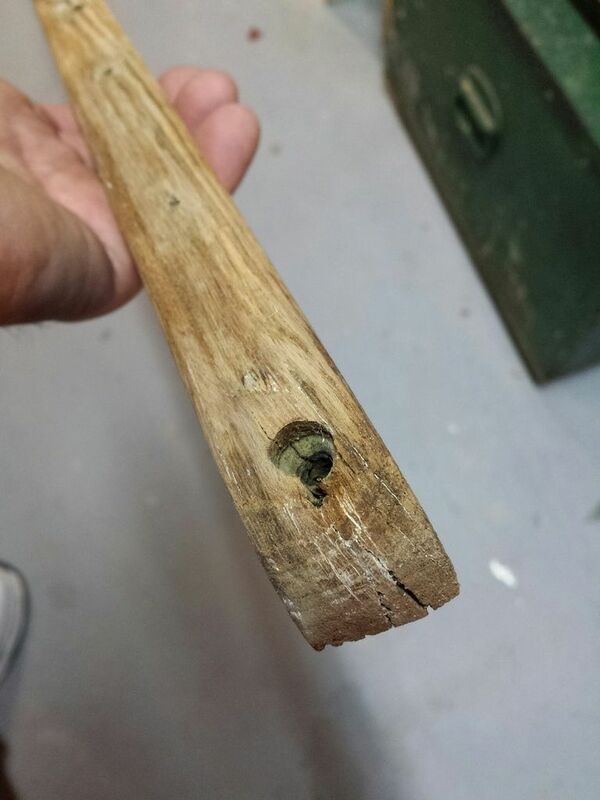 Two interesting finds was that the plank at the turn of the hull was fastened to the frames with much larger screws on the back half. 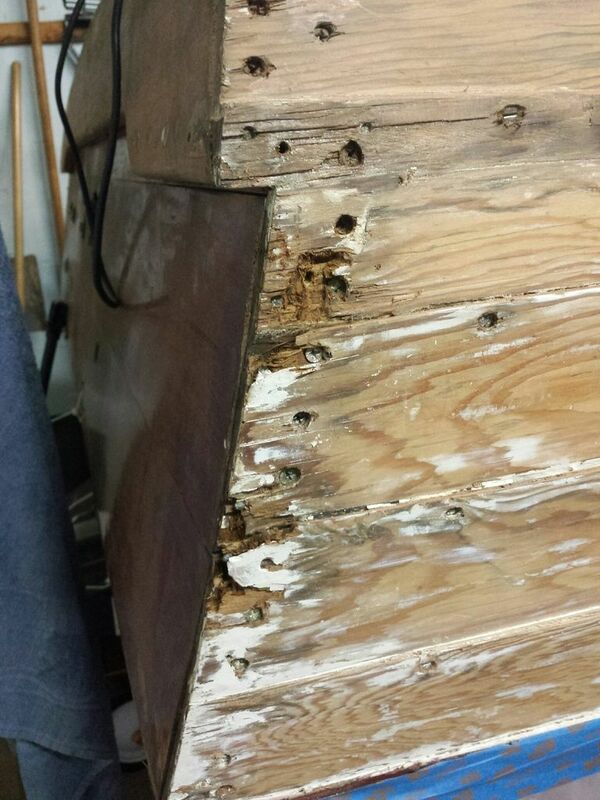 And the builders drilled the holes for the screws really deep on the transom board. Like more than half the depth of thickness of the wood. Maybe they did so to get the depth into the stringers end grain. So what do I do next? Trying to decide if I should fix the hook as described somewhere earlier in the thread, or tightening the same 1600 plus plank fastenings, including replacing the screws that go into the frames with the next larger size as the ones that are there are not only so loose I can turn them with a pic, but the few I tested just stripped out when I tightened them down. Clearly the screw holes are chaffed out. I tested with the next size up and they tightened up nice a snug and firm. I'm thinking fixing the hook next. So long since your last post some of us were convinced you'd finished and gone boating, leaving your readers stranded. There's a wealth of information and education in your posts. What to do next? My sense is you'd kick yourself if you did not go on to fix that hook, as you intimate.